Turtles and tortoises are representatives of a very ancient group of reptiles and scientists have much still to learn about their origins and how the Chelonia (the name given to tortoises, turtles and terrapins) evolved, but new research by a joint German, Hungarian and Chinese research team is helping to shed some light on these shelled creatures. The scientists have been studying the beautiful, fossilised remains of Early Cretaceous turtles from north-eastern China in a bid to determine how the first sea turtles arose. The extant sea turtles found today, represent just a tiny portion of what was once, a hugely diversified group. There are just seven species, the majority of which are very vulnerable to extinction. The first sea turtle fossils appear in Cretaceous aged rocks some 130 million years old, it is very likely that these marine animals evolved from a common, freshwater ancestor, although this ancestor has yet to be identified. In this new study, Dr. Chang-Fu Zhou of the Shenyang Normal University of Liaoning and Dr. Márton Rabi of the Biogeology Workgroup of the University of Tübingen and the Hungarian Academy of Sciences tried to identify the ancestors of modern sea turtles from amongst the many excellent turtle fossils that represent the famous Jehol Biota of the Early Cretaceous of north-eastern China. The newly-described fossil species, Xiaochelys ningchengensis from north-eastern China’s Jehol Biota; right: an illustration of the skeleton incorporating positive and negative impressions preserved in the layers of stone. The picture above shows the slab and counter slab of the newly described Cretaceous turtle Xiaochelys ningchengensis from north-eastern China. To the right of the photograph a line drawing has been produced to show the preserved features of the shell (scale bar = 20 mm). The Jehol Biota is a rich Cretaceous ecosystem preserved in a multi-layered rock formation cropping out in the Chinese provinces of Liaoning, Hebei and Inner Mongolia. The habitat represented is that of a temperate forest zone, with large lakes in situ. Nearby, volcanoes occasionally covered the area in fine ash and this led to the exquisite preservation of many of the fossils to be found in these regions. The most famous fossils associated with these strata are feathered dinosaurs, animals such as Sinosauropteryx, Sinornithosaurus, Microraptor and the recently described Zhenyuanlong suni. 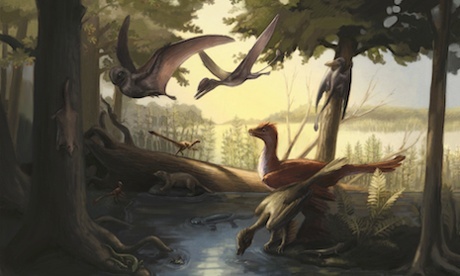 A rich and diverse environment dominated by small mammals, Pterosaurs and feathered Theropods. 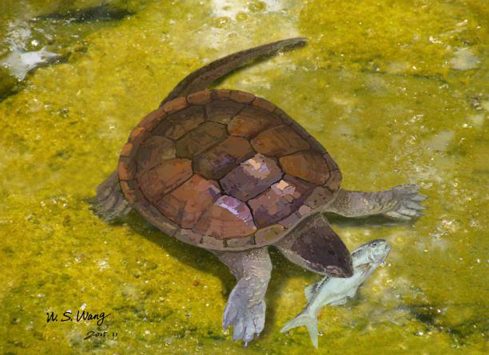 Ironically, despite this part of the world’s connection with feathered dinosaurs, the first vertebrate of the Jehol Biota to be described was a freshwater turtle (1942). The research team have described a new species of freshwater turtle, adding to the rich vertebrate assemblage known to have existed in this part of the world during the Early Cretaceous. A study of the fossils of X. ningchengensis was undertaken to ascertain whether this ancient turtle, whose shell was not much bigger than a saucer, was a potential ancestor of today’s sea turtles. Dr. Zhou and Dr. Rabi applied comparative morphological assessment techniques to try to map this turtle’s position in relation to other members of the Chelonia, this produced a comprehensive phylogeny diagram of turtle evolutionary relationships leading to today’s living turtle species. The scientists wanted to test an earlier hypothesis that the Jehol Biota turtles belong to a lineage that eventually gave rise to extant marine reptiles. In the picture above, the small, freshwater turtle Xiaochelys ningchengensis has caught a fish (Lycoptera spp.) fossils of these fish are associated with the same strata as the X. ningchengensis material. Xiaochelys (pronounced sho-ow-key-lis) comes from the Chinese Pinyin “Xiao” a reference to the small size of this taxon and the Greek for turtle “chelys”. The trivial name honours the type locality, Ningcheng County (Inner Mongolia). The research has been published in the latest edition of the academic journal “Scientific Reports”. The Cryptodires, which also include sea turtles, are able to pull their heads and necks vertically into their shells using an S-shaped motion. The statistical analysis only just placed the likes of Xiaochelys outside the ancestral line of modern turtles, so it is quite likely that this Cretaceous turtle was quite similar to those types of turtle that were ancestral to the modern forms. It is not clear however, just how the main adaptations of marine turtles arose. These evolutionary changes included the reduction of their skeleton and the development of large, rigid paddles which enable the creatures to swim in a style which is best described as “flying underwater”. The Chelonia, throughout their long evolutionary history seemed to have evolved into a myriad of forms with several lineages “flipping” between a terrestrial and fully aquatic existence. Scientists still don’t really understand how the Chelonia evolved and changed since they first appeared many millions of years ago. Everything Dinosaur acknowledges the help of Tübingen University in the compilation of this article.